A new Chinese smart phone company is coming to India QiKU Network Technologies (Shenzhen) Co. Ltd. (QiKU is a joint venture of Qihoo 360 and Coolpad.) with phone named QiKu Q Terra, a smart phone with 6 inch screen and dual 13 megapixel cameras on the back. The Phones comes with a 6 inch Full HD IPS display with 1080x1920 pixel resolution and Gorrilla glass 3 for protection. 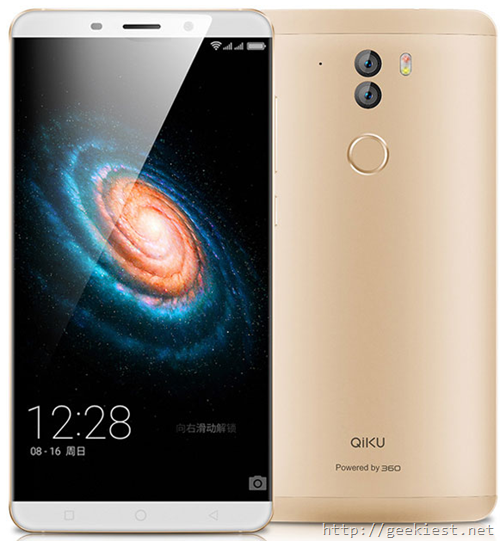 The QiKU Q Terra is powered with a 2GHz Qualcomm Hexa-Core Snapdragon 808 processor and Adreno 418 GPU, 3GB LPDDR3 RAM. It consists of 16GN internal storage and supports up to 128GB of Micro SD card storage.The Phone will be running on the Android 5.1.1 based 360 OS. One of the main attraction of the phone is the Camera, the phone will have two 13 megapixel cameras (one with Sony IMX278 sensor and other with Sony IMX214 sensor) on the back side with dual tone LED flash. It will also have a 8Mp front facing camera. The phone also will have a fingerprint scanner. The phone will support dual SIM cards, the second slot can be used as the Micro SD card slot). The power will be given from 3700 mAh non removable fast charging battery. The company claims 2 hours of usage after you charge your phone for just 5 minutes and the phone will be completely charged if you charge it for just 70 minutes. The phone will be available in the market for just INR 19,999 if you have an invite and otherwise you will have to pay 21,999 for this device. The invite system will start from December 5, 2015.